In a short period of time, Chris has made big gains in self-care, language and social skills. Chris, who is 14 years old and lives with Down Syndrome, continues to grow with the support of the Easterseals UCP program called Individual and Community Services (ICS). Program staff work with teens and adults with Intellectual or Developmental Disabilities to acquire and maintain skills to help them live with greater independence. A paraprofessional works with Chris on skills including money management in the community, social skills, and requesting his wants and needs in full sentences. “I’m proud of Chris in the steps he has made. He has an awesome support system including his family and Easterseals UCP,” said Jacob Johnson, an Easterseals UCP Direct Support Paraprofessional, who has worked with Chris for two years. Jacob said, “Chris has a go-getter mentality with a big personality that lights up the room.” Not only do Chris and Jacob work on goals, but they have fun doing so with outings including the gym, a trampoline park and the movies. 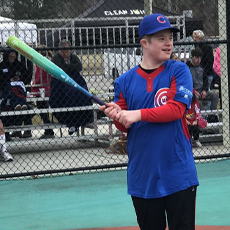 Chris loves sports and has joined the Miracle League in Wilmington where he is surrounded by friends and fans. 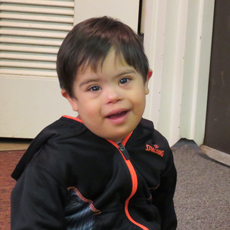 Learn more about the Easterseals UCP Individual and Community Services Program.